I followed some Pin-spiration to go along with my recent scale project, with a few modifications, of course. The first thing I had to do was remove the labels and underlying sticky residue on the bottles. I remembered that I had some rather old de-solv-it in a box I had started to unpack. I'm thinking it's at least six years old. It worked like a charm. (Good to know, since I save most glass containers, and wasn't sure how to get rid of the residue). Next, count out the number of marbles needed. Some people use a different color for every milestone. I didn't read about that idea until after I decided to use all green ones. Put all the marbles in one container. This was the demoralizing part of the project. Then, I realized that my containers were way too big, which made me feel better again. So I found a couple pasta jars and cleared off the residue. Maybe other people have really good memories and can remember how many marbles are in each jar. I can't, so I made this little chart to put in the "lost" jar. I also included a pen so I wouldn't have to look for one each week. I switched letters after I saw these, which are slightly larger than the other ones. I love sticky letters. Apply to the jars and place in a prominent place. Mine are in the closet next to my clothes. Until my health stabilizes again, my fitness goals are rather modest, but these jars will help me remember the big picture and hopefully motivate me toward that day when I can really exercise hard again. This is a great motivational technique. Love it! Came over from Blog Bulge. I already follow you. Love reading your posts. Thanks for visiting. And thanks for following! Great method. I'm going to use this as my motivator. Found u on Blog Bulge and happy to follow. I love this idea! I may have to copy it...I'm a visual person as well. How's it working for you. 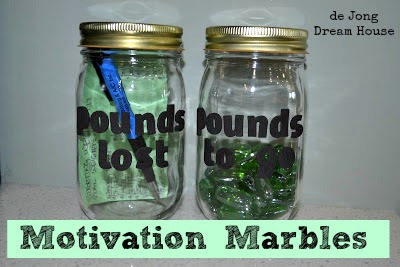 I think I would try harder just to see the lbs lost jar rising up! Thanks for linking up Dear! It's a little slow going with my brain injury, but my doctor has some new ideas.